Why Use Power Kleen Green? Tanning bed acrylics are very expensive and can be easily damaged if you use the wrong cleaner. Some cleaners with hash chemicals can dull or dry out the tanning bed acrylic, this can make the acrylics brittle and will be more likely to crack. Some cleaners are abrasive and this can also damage the acrylics by making faint scratches in the acrylics. Strong chemicals can cause the tanning bed acrylics to "fog" and that will also cut down on the VU light that comes through the acrylics. 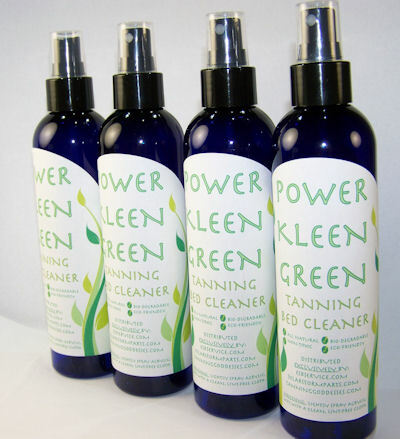 Power Kleen Green is safe and effective to be used on tanning bed acrylics and ALL plastic parts of your tanning bed. Power Kleen Green's easy to use cleaner formula - just spray on and wipe off with a soft lint free cloth! * No Mixing - Just Spray and Use! Using the proper cleaner on your tanning bed acrylics when they are new, will help your tanning bed acrylics last longer. Keeping your tanning bed acrylics clean will also allow the UV light from your tanning lamps to penetrate the acrylics better, giving you a better tan. Power Kleen Green tanning bed cleaner will keep your tanning bed acrylics clean from skin oils, sweat, tanning lotion residue, dirt, and dust. Power Kleen Green is gentle and effective cleaner for any home tanning bed acrylic and can be used on the cover, arm, end caps and other plastic parts. Power Kleen Green is available in two sizes a 8 fl. oz. and a 16 fl. oz. spray bottle.